Spring Break season is here - which means VACATION! - which means many of you are on the move with your families, navigating crowded airports and rest stop bathrooms with hygiene of questionable merit. Plus, if my lawn ever thaws out, I might even begin to believe that summer's around the corner too, which brings with it even more potential for you to enjoy weeks of living out of your luggage and hours of marital spats. What? Marital spats? Spouses... argue? On vacation? Yes, it's true. Sometimes, if kept in tightly enclosed spaces like mid-sized sedans or hotel rooms or Nebraska, people will start to get on each other's nerves. And if those tightly enclosed people are simultaneously suffering from a severe allergic reaction to being too far away from their couches and DVRs, even the most loving, rational couples will turn into rabid wolves. Annoyed rabid wolves. This condition usually manifests itself around Day 3 of vacation (Day 2, if traveling by RV), but sometimes symptoms can appear almost immediately upon leaving the neighborhood, like when one spouse suddenly changes lanes to get onto the Toll Road instead of just taking the Bypass to the airport like a normal person, because only an idiot takes the Toll Road, but WHATEVER. As you navigate the treacherous roads to Yosemite or Wally's Splashin' Fun Land or wherever your wanderlust takes you during the coming vacation-heavy months, I'm here to help you navigate the treacherous roads of tiffs and quarrels and spousal blood lust during the coming vacation-related arguments. 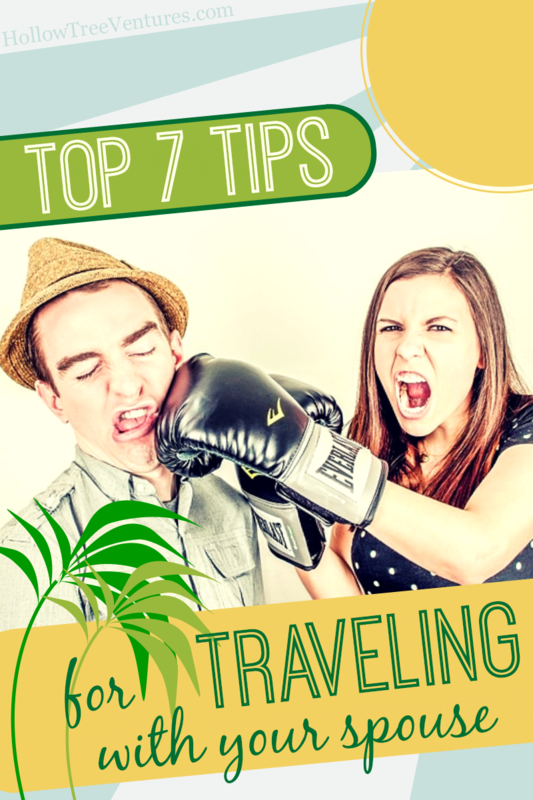 To that end, below I've listed the top 7 tips for traveling with your spouse; these must-follow guidelines will help ensure your trip stays fight-free! Or, as fight-free as possible. 7. Tinder for an early, festering seed of annoyance can often be lit by the amount of luggage you each packed. I don't mean to be sexist, but typically it's women who cram every article of clothing we own into 57 suitcases, whereas other people (fellas, I'm looking your way) just throw a toothbrush into a knapsack on their way out the door. Avoid an argument by recognizing that some people dress by mood, and since they don't know whether they're going to feel feminine or sporty or bloated (yes, "bloated" is a mood) while away from home, they need to bring ALL THE THINGS. Ladies, make it easy on your gent by packing some of your stuff in his knapsack to even things out. Problem solved! 6. Another source of contention is the number of stops you make en route. To avoid rifts on the road, follow these simple rules: Stop for bathroom emergencies and cases of near-starvation only. Furthermore, food is to be purchased at fast food drive-thrus - neither sit-down restaurants nor convenience store Slim Jims are acceptable travel meals. And NO, we're not stopping to see the World's Largest Ball of Twine. Don't be ridiculous. 5. What happens when city slickers (people who enjoy 5-star resorts and spas) try to travel with granolas (people whose idea of a good time includes camping, fishing, and backpacking to youth hostels)? You're best served by backpacking to a 5-star resort, where you can camp in the lobby and survive on avocado facial scrub you scavenge from the spa. Everyone's happy! Except for the hotel manager, but who cares if you fight with him? This is one of the compromises we make for marital harmony. 4. How much money should be allotted for souvenirs? Bypass potential financial fights by agreeing on a dollar amount before you leave,* keeping in mind that kitschy bobble-heads and commemorative snow globes are to be avoided at all costs. *The correct answer is zero dollars - except for the $500 you'll spend on poorly-constructed T-shirts that fall apart after two washings. 3. Statistically speaking, one of you is probably a Schedule Nazi. Do you plan activities for every minute of your family vacation in order to maximize Vacation Fun, print out color-coded itineraries, and refuse to deviate from your plan, no matter what? I hate to break it to you, but you're a Schedule Nazi, and your spouse hates it. Stop it. Stop it right now. They probably just want to relax by the pool or beach, whichever has the most convenient bar - are you seriously favoring a visit to the local Rubber Band Museum over a swim-up bar? You need to reevaluate your priorities, my friend. 2. Let me guess - one of you is an insane adrenaline junkie who doesn't mind consuming nothing but watered-down amusement park Coke for 19 hours straight, while the other one of you is "no fun" because you won't stand in line for three hours to ride a roller coaster when it's 97 degrees outside and the whole waiting line smells like a rancid hot dog stand. In this case, you're both wrong - you should have vacationed with the couple hanging out at the swim-up bar. Rookies. 1. 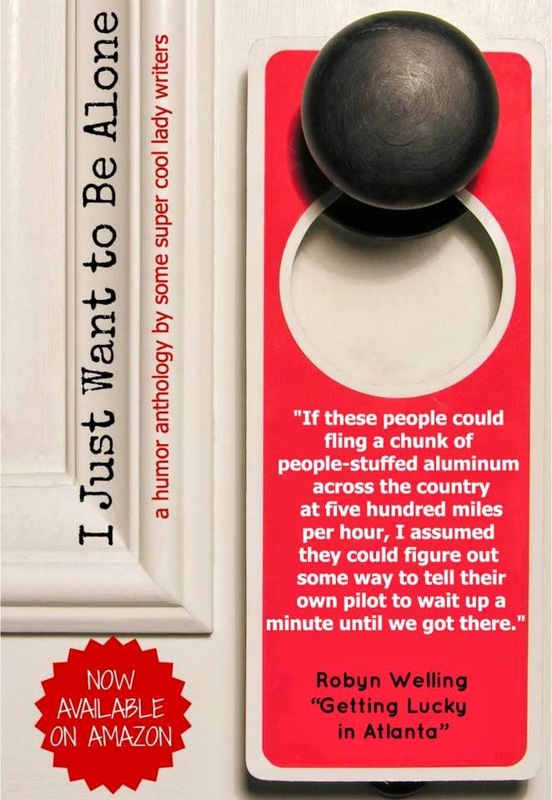 Here's one last spousal travel tip that just can't miss: be sure to pack a copy of I Just Want To Be Alone. Why yes, that IS the fabulous anthology, newly released on March 22nd, which climbed immediately to the top of Amazon's Best Sellers chart in parenting and family humor, and YES, I do have an essay about taking a honeymoon vacation with my fabulous husband in that fabulous, best-selling anthology! However, that in no way has clouded my judgement about including this book in your ideal travel guide for the survival of your marriage. I'd include it anyway, because it's so funny and it's all about relationships - which makes it the perfect thing for the two of you to read together while you vacation-bond over how hilarious relationships are! But, if my first six tips don't actually prevent you guys from sniping at each other while you're on the road, this book will also be the perfect thing for you to read alone while administering the Silent Treatment, as your spouse looks on with great jealousy because the essays generate the genuine guffaws and cry-laughter that will show him what a great time you're having on vacation despite the fact that he's being an insensitive jackass who doesn't know the first thing about how cranky a person can get when they're bloated from eating too many Slim Jims! So, friends, happy travels, and happy reading! I sincerely hope your relationship survives any vacation travels you have planned, not to mention surviving all this advice I've given you.